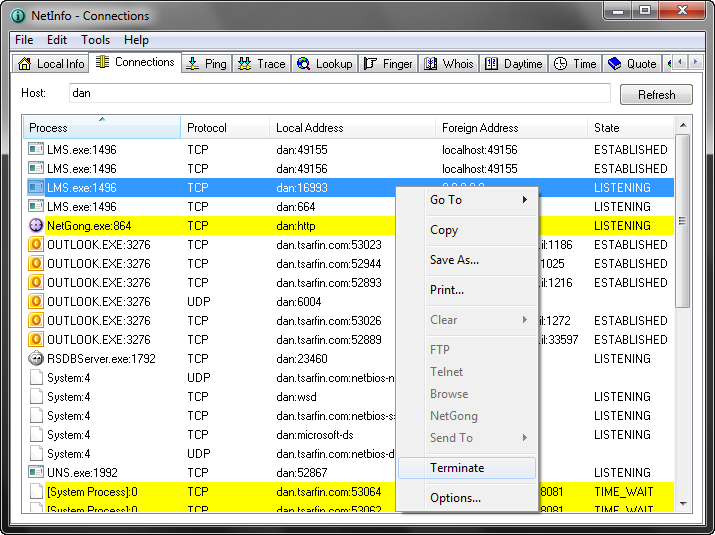 NetInfo is a collection of 15 different state-of-the-art network diagnostic tools on a single, easy-to-use interface. Designed from first-hand experience, NetInfo allows businesses to more effectively combat network downtime by allowing network administrators, webmasters, and Internet service providers to more accurately isolate faults, simplify processing of diagnostic data and increase internal network security. Main features: displays system IP addresses and MAC addresses, displays all local TCP/IP connections and their foreign connection IP address, allows you to quickly verify network connectivity to another IP address on the network, displays a list of routers between your system and the destination system, allows you to perform DNS forward and reverse lookup queries, displays information about users currently logged on to a specified server, allows you to query contact information for domains registered with a Whois server, displays the local time of day for any remote host specified, allows you to query the time value from a remote time server and synchronize the time value with your local system clock, allows you to view quotations from a remote Quote server, displays the HTML header code for any Web page address specified, scans for host names for a particular range of IP addresses and displays the state of each IP address in the range, lists the available network services (HTTP, Telnet, DNS, SMTP, and so on) for a particular host, allows you to verify any e-mail address by simply entering a full user principal name (user@domain.com), displays available online tools, how-tos, tips, and news. Recent Changes: This release includes improved support for geographic location technology, improved support for Google Maps technology, and improved Lookup tool that reports IP geolocation data and allows you to easily locate a network address on a Google Map. Additional Requirements: Windows XP/2003/Vista/2008/7/2008 R2/8/2012 (32-bit or 64-bit versions).